This PDF 1.5 document has been generated by ILOVEPDF.COM, and has been sent on pdf-archive.com on 23/08/2015 at 15:00, from IP address 103.5.x.x. The current document download page has been viewed 343 times. File size: 735 KB (35 pages). Transistor, or BJT for short. layer and no current flowing through the device. Therefore the transistor is switched &quot;FullyOFF&quot;. Emitter potential must be negative with respect to the Base. flowing through the transistor. Therefore the transistor is switched &quot;Fully-ON&quot;. transistor, the Emitter potential must be positive with respect to the Base. turns &quot;ON&quot; acting like a closed switch and maximum circuit current flows through the device. An example of an NPN Transistor as a switch being used to operate a relay is given below. that can act as either an insulator or a conductor by the application of a small signal voltage. connecting terminals with each terminal being given a name to identify it from the other two. Collector ( C ) respectively. of the power supply for each type. types, exactly the same as for the standard diode symbol. circuit as the static characteristics of the transistor vary with each circuit arrangement. 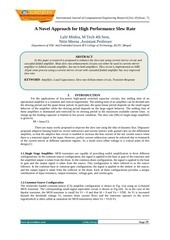 configuration &quot;attenuates&quot; the input signal. HIGH as it is taken from a reverse-biased PN-junction. value of Alpha will always be less than unity. current flowing in the base will thus control the current in the emitter-collector circuit. Typically, Beta has a value between 20 and 200 for most general purpose transistors. the base terminal and &quot;Ie&quot; is the current flowing out of the emitter terminal. circuit resulting in the output signal being 180o out-of-phase with the input voltage signal. region of hundreds of thousands of Ohms while having a relatively low output impedance. therefore, providing good current amplification with very little voltage gain. power gain and this is summarized in the table below. collector current to the base current. the Base resistor RB, which again is used to limit the maximum Base current. This file has been shared by a user of PDF Archive. Document ID: 00297341.